Stems: Decumbent to ascending or erect, branched from base, glabrate or soft-pubescent to villous. Leaves: Alternate, cauline; stipules ovate to lanceolate, 1/4 to 1/2 inch; petiole 0 to 2.4 inches; blade pinnately or palmately compound; leaflets 3-5, obovate to oblanceolate or oblong, 2/5 to 2 inches long, 1/5 to 1 inch wide, margins crenate-serrate, tip blunt, lower surface pubescent to villous, upper surface glabrous. Flowers: Pedicels 0 to 1 inch; bractlets immediately subtending the calyx 5, elliptic, 1/12 to 1/4 inch; sepals 5, ovate-triangular, 1/12 to 1/8 inch; petals 5, pale yellow, cuneate-obovate to oblanceolate, 1/20 to 1/8 inch; stamens (5)-10(-15). Fruits: Achenes yellowish brown, ca. 1/32 inch, usually smooth, sometimes rugose, without corky appendage along inner margin. 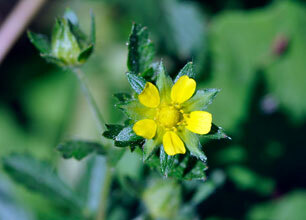 Comments: Potentilla, potent and little, alluding to the medicinal properties of some species and rivalis, of brooksides.